Media caption"There's something about when you become an MP... you almost become de-humanised." Chuka Umunna says he avoids standing near the edge of Tube platforms because of worries for his safety. The Labour MP was speaking after the Committee on Standards in Public Life called for a crackdown on the rise in intimidation and abuse at elections. It said a new criminal offence of "intimidating parliamentary candidates and campaigners" should be created. The watchdog also called for social-media companies to tackle "vile and shocking abuse" of politicians. 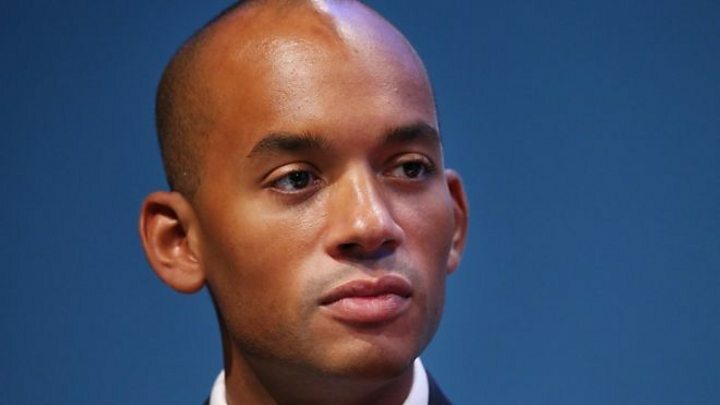 Speaking to BBC Radio 5 live's Emma Barnett, Mr Umunna said: "I have to say most members of the public, 99% of the time are very pleasant to me when they stop me on public transport all over the country - but you do worry about your public safety. "I'm careful I do not stand anywhere near the edge of a Tube platform; I get worried sometimes that people are going to push me over." He added: "There's something about when you become an MP... you almost become de-humanised. "And then of course it becomes a self-fulfilling prophecy because you'll just end up with odd people in politics and politicians will be hated even more." As well as calling for social-media companies to do more, the committee also points the finger at the leaders of major political parties. Leaders should "always call out intimidatory behaviour" even if it is perpetrated by those on the fringes of their party, the committee says in a new report. Parties must also produce joint codes of conduct on abuse and intimidation during election campaigns by December 2018. And they should hold regular meetings with their rivals during election campaigns to make sure the code of conduct is being enforced, the committee says. MPs from all parties have spoken about intimidation they were subjected to during the general election, with Labour's Diane Abbott talking in graphic terms about the racist abuse directed at her. The report, which was commissioned by Prime Minister Theresa May, urges the government to legislate to shift liability for illegal content on to social media and other internet companies to tackle an "intensely hostile online environment". It says Facebook, Twitter and Google "are not simply platforms for the content that others post" because they play a role in shaping what users see, and so "must take more responsibility for illegal material". But Brexit might provide an opportunity for the government to take action - because social-media companies are not currently liable "largely" due to a European Union directive that treats them as "hosts" of online content. Committee chairman Lord Bew said: "This level of vile and threatening behaviour, albeit by a minority of people, against those standing for public office is unacceptable in a healthy democracy. "We cannot get to a point where people are put off standing, retreat from debate, and even fear for their lives as a result of their engagement in politics. "This is not about protecting elites or stifling debate, it is about ensuring we have a vigorous democracy in which participants engage in a responsible way which recognises others' rights to participate and to hold different points of view." A new criminal offence of intimidating candidates would "serve to highlight the seriousness of the issue" and act as a deterrent, the committee's report says. The committee says it is also concerned about the impact on the diversity of a British democracy and political parties have an "important responsibility" to support female, black and minority ethnic and gay candidates. It also calls for legislation to remove the requirement for candidates standing as local councillors to have their home addresses published on ballot papers. And it says traditional media outlets also have to think about how their coverage "might incite intimidation through delegitimising someone's engagement in the political process, placing undue influence on their individual characteristics, or using threatening language". Facebook said in a statement: "We want parliamentarians and election candidates to feel safe on Facebook." The company said it had already offered advice and training to "over 5,000 candidates on how to report abusive content and keep their accounts secure". And it was "making significant investments in hiring more people who understand the issues around candidate safety" as well as working with anti-abuse charities.